Pre-Spanish cultures of the Andean Region in Peru (such as the Chavin, Tiahuanaco, Mochica, Chimu, Nazca, Wary Empire and Inca Empire) used to build cities outside of the arable land. Modern Peruvians no longer sustain that traditional urban policy. 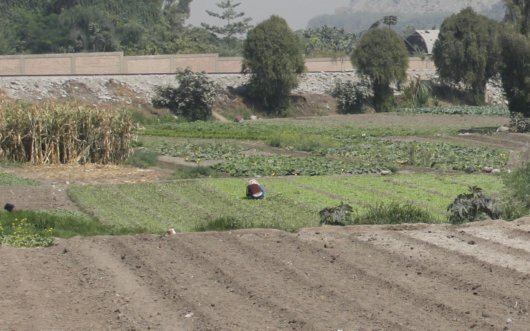 Lima, a metropolis 9 million people, is expanding over the Rimac River valley, invading invaluable croplands. Former peasants, whose lands are becoming urbanized, maintain their activities in fragmented plots of land, temporally, as they are not yet covered by asphalt or concrete. We can see in this picture how the city is expanding inexorably over the croplands. It is particularly sad, because the Peruvian coast is a desert and scarcely 3% of Peruvian territory can bear annual crops in a sustainable way. Photo and post by Sebastiao Ferreira. This post is number 14 of 52 in Sebastiao’s 52-week photo journal.